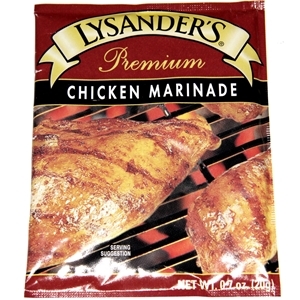 Only the finest herbs & spices go into Lysander's products . Combine marinade with 2/3 cup cold water and dissolve thoroughly. May be necessary to break up seasoning. Place meat in marinade for 15 minutes. Make sure chicken is coated thoroughly with marinade. Remove meat from marinade. Grill, broil, bake or microwave.